The A- and D-strings have a high-tensile steel core and are wound with a precision chrome steel flat wire, while the G- and C-strings have a specially designed steel rope core with a top-quality tungsten winding. 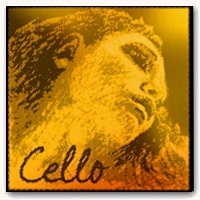 The elegant sound of the new Evah Pirazzi Gold cello strings is clear, full, with character. These new steel strings provide a variety of overtones with great projection – without any metallic sharpness. Our new Evah Pirazzi Gold cello strings are extremely responsive and react quickly over the entire dynamic range; even with very gentle bow pressure. With their reduced playing-in time the instrument achieves its full sound spectrum in no time. 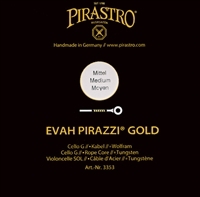 Each Evah Pirazzi Gold cello string has its own individual character and at the same time their interplay generates a wonderfully harmonious set. Beginning with a smooth and rich spectrum of sound colors, the A-string has a warm and silvery sound that will easily satisfy the expectations of soloists. Charm, brilliance, and lightness are the sound characteristics of the D-string. The seamless transition to the G-string adds a further nuance that can be heard: The sound becomes very grand and develops an impressive radiance – even straight after stringing. Vibrant and resonant the C-string was designed to provide the player with a focused direct sound that will inspire and at the same time bring this set to its powerful completion.